An accessible TTC is about more than just fairness, it’s about our health and we have an opportunity to improve what is, for many, a patchwork system. With the TTC committed to barrier-free transit for all by 2025 it is important to understand the growing need for safe and equitable transit access. Individuals living with disabilities are more likely to experience poverty especially those living in urban areas with higher costs of living and rely primarily on public transportation to get around. Over 470,000 Ontarians are currently living on ODSP. Many individuals on ODSP have physical disabilities or mobility issues. 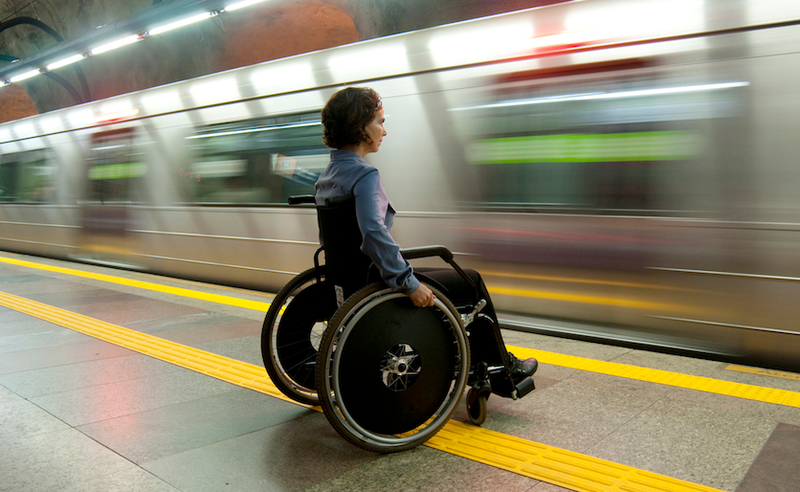 The limited accessibility of transit services impacts health equity by limiting access to health services, employment, healthy food and social activities. The lack of access further isolates individuals with disabilities and impacts their ability to be engaged in their communities and find employment. Accessible transit can support increased physical activity and promote social inclusion. In 2010, Canada ratified the United Nations Convention on the Rights of Persons with Disabilities (CRPD) and it is the responsibility for all levels of government to ensure persons with disabilities can fully participate in Canadian society. However, in Toronto only 34 of 69 subway stations are accessible by elevator. As of 2015 all TTC buses are low-floor and equipped with ramps, yet 20 percent of bus stops are still not fully accessible. Low-income residents are 1.6 times more likely to use public transit to commute to work compared to high-income residents. 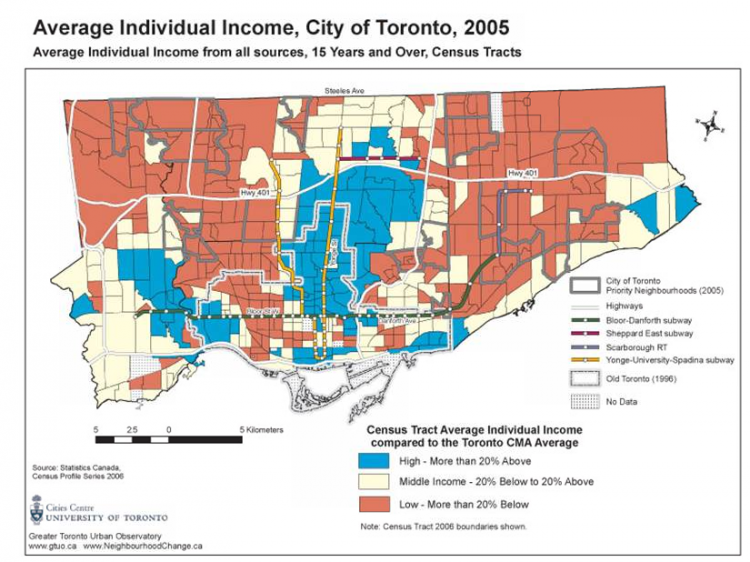 The Three Cities Report within Toronto shows that many low-income households live outside the downtown core. However services and employments opportunities are still concentrated downtown and for low-income individuals with accessibility needs long travel times impact equitable access to services and opportunities. Toronto is failing at protecting the rights of persons with disabilities by not providing accessible services and programs throughout the city. The city is changing and the need for accessible transit will only grow. Older adults and individuals with mobility issues rely heavily on public transit. From 2014 to 2015 there was a 12.4 percent increase in total Wheel-trans passenger rides and demand will increase in the future as our aging population in Toronto continues to trend upwards. By 2031 it is projected that 21 percent of the population will be over the age of 65. In 2006 an estimated 8.6 percent of public transit users were over 65. 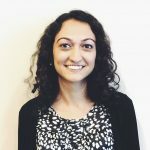 Improving accessibility of TTC could mean relying less on specialized services like Wheel-trans. Not only is Wheel-trans more costly to the system the rigid eligibility criteria and long wait times leads to a service that isn’t meeting the needs of many individuals. Wheel-trans is in high demand and riders continue to face long wait times for booking. Moreover, Wheel-trans passengers have to wait early for their ride which often results in arriving significantly early to a destination. For short trips, like a quick appointment, individuals spend more time waiting for Wheel-trans than the actual duration of the trip itself. If the public transportation system became more accessible many individuals would prefer riding subways or buses to travel independently, save time and make spontaneous trips. The federal government announced $500 million for TTC infrastructure with some of the funding going towards making stations accessible. However, with the city’s plan to invest transit funding on SmartTrack and ongoing transit projects where will the necessary funding to improve accessibility come from? The TTC should be commended for their plans to make the system more accessible by 2025 but it will require significant investment in infrastructure. The federal government should allocate additional funding to prioritize equitable access for people with disabilities. The changes to transit infrastructure is an opportunity to prioritize accessibility and consider how it could benefit the health and well-being of Toronto residents in the future. During the 2015 ParaPan Am games in Toronto, the TTC added accessible shuttle bus services to help athletes and visitors get around highlighting the challenges individuals with disabilities face on a daily basis getting around the city. When looking at the TTC subway map it is striking how some long stretches such as from Islington to Old Mill on the west end and Donlands to Woodbine on the east end are not accessible at all. Summerhill Station, the closest subway station to Wellesley Institute, won’t be fully accessible until at least 2023. Where does that leave individuals who need to get to businesses, job interviews, appointments and other services in the area right now? An accessible system gives people a choice in how they travel around the city whether by bus, subway, streetcar or Wheel-trans. In Vancouver where TransLink is responsible for regional transportation, there has been great progress made in providing accessible transit for people living with disabilities. Buses, SkyTrain stations and community shuttles are all currently accessible. Recently in London, England a pilot was introduced to raise awareness on invisible disabilities with riders opting to wear a “Please offer me a seat” badge that identifies they face a disability and may need to use accessible seats. We should not be lagging behind other cities. The TTC Public Forum on Accessible Transit on September 15, 2016 was an important step in planning for accessibility to meet the diverse needs of riders and in building a more inclusive system. Toronto needs a vision for accessibility in the city and the transit system can lead the way. Toronto needs a vision for accessibility in the city and the transit system can lead the way.